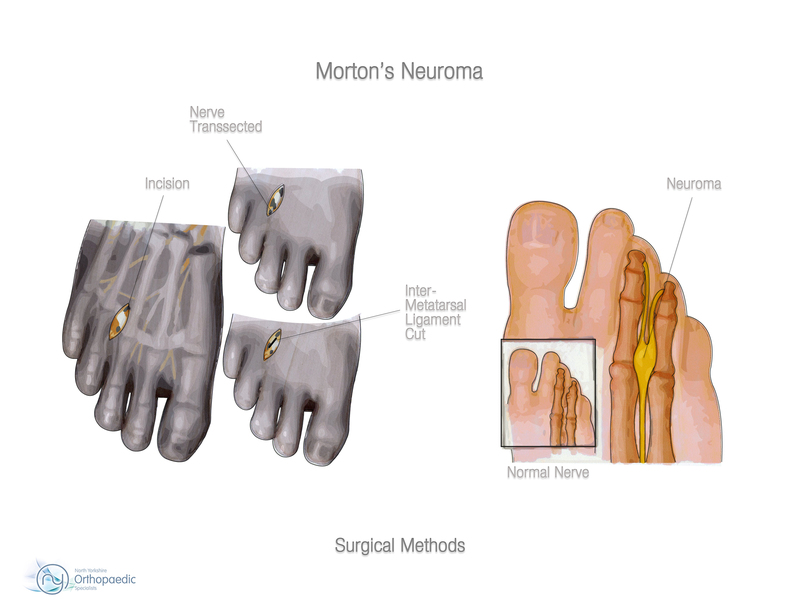 The incidence of Morton's neuroma is 8 to 10 times greater in women than in men. 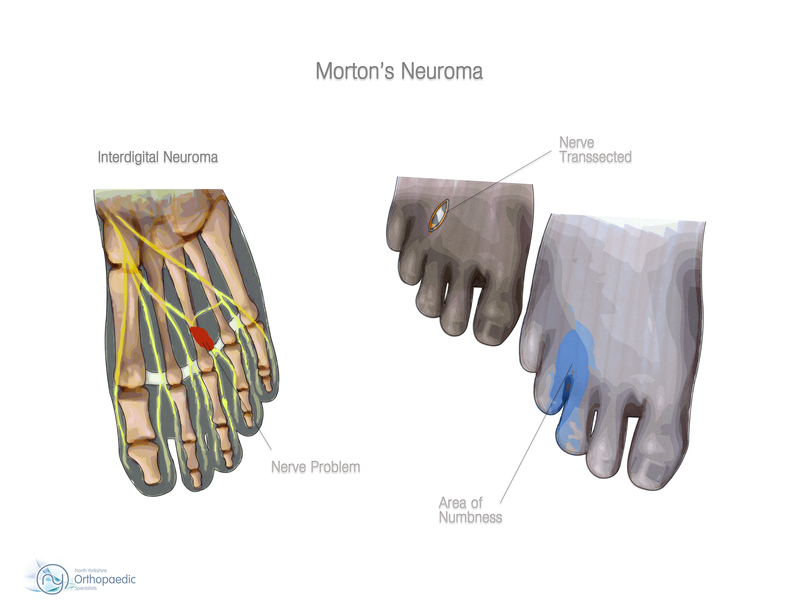 Morton's neuroma occurs as the nerve passes under the ligament connecting the toe bones (metatarsals) in the forefoot. It most frequently develops between the third and fourth toes, usually in response to irritation, trauma or excessive pressure. During the examination, your physician will feel for a palpable mass or a "click" between the bones. He or she will put pressure on the spaces between the toe bones to try to replicate the pain and look for calluses or evidence of stress fractures in the bones that might be the cause of the pain. Range of motion tests will rule out arthritis or joint inflammations. X-rays may be required to rule out a stress fracture or arthritis of the joints that join the toes to the foot. • Changes in footwear. Avoid high heels or tight shoes, and wear wider shoes with lower heels and a soft sole. This enables the bones to spread out and may reduce pressure on the nerve, giving it time to heal. Several studies have shown that a combination of roomier, more comfortable shoes, nonsteroidal anti-inflammatory medication, custom foot orthoses and cortisone injections provide relief in over 80 percent of people with Morton's Neuroma. If conservative treatment does not relieve your symptoms, your orthopaedic consultant may discuss surgical treatment options with you. Surgery can resect a small portion of the nerve or release the tissue around the nerve, and generally involves a short recovery period. Surgery may be necessary if non-surgical treatments have not worked or if there is severe pain in your foot. Surgery is usually performed under local anaesthetic and is usually carried out on an outpatient basis, which means patients do not have to stay in hospital overnight. The operation can take up to 30 minutes. A small incision is made either on the top of your foot or on the sole. Surgeons may try to increase the space around the nerve (nerve decompression) by removing some of the surrounding tissue, or they may remove the nerve completely (nerve resection). If the nerve is removed, the area between your toes may be permanently numb. After the surgical treatment patients will need to wear a special protective shoe until the affected area has healed sufficiently for them to wear normal footwear. It can take up to four weeks to make a full recovery. Most people (about 75%-85%) who have had this surgery have positive results and their painful symptoms are relieved. As with all surgeries, complications can occur and patients should discuss these with their consultant before they have the procedure.